It is not my style to share my family’s life events with the world, but there are certain events that seem to require some public acknowledgment. Below is a letter I wrote to my son, Aaron Broyde, on the day he commenced basic training in the Israeli army. I write this letter to you on the day of your commencement of basic training in the IDF and I write as much for me as for you – but in truth, I write words from the heart to express my love and admiration of you and what you have set out to accomplish. You come from a family of cowards. Click here for moreYou come from a family of cowards. I never even thought of serving in the military, neither in Israel nor in America; your grandfather picked a profession in the 1950’s that was draft-exempt for a reason, and your great-grandfather (after whom you are named) bought an egg farm in Vineland, NJ in 1941 to make sure he would not serve in World War II. But yet – running directly against a multi-generational trend – here you are starting the IDF with the rest of your hesder class of the Hesder Yeshiva of Petach Tikvah, as a member in training of the Kfir Brigade. You are the first “Broyde” to serve in any army in centuries, to be honest. I am exceptionally proud of you and I write to express both why I feel that way and how deep my feelings are. We raised you to be a Religious Zionist full of the vim and vigor of that wonderful ideology and movement. Whether it is through the frequent trips to Israel, near constant learning with the members of the Atlanta Torah Mitzion Kollel or ongoing exposure to religious Zionist role models – you first met the Rosh Yeshiva of your yeshiva in our house during a shabbaton – we wanted living in Israel to be a real option for you. And it is. We are so proud of that. That is not the choice I have made. I, like most of my own teachers and friends, have become an armchair Zionist. As involved as we might want to be in the religious Zionist enterprise, we all still seem to be living in America. The dreams that we have, we choose to keep as dreams, not daring to fulfill them. Whatever excuses we all might have – and I have my share – in the end, they remain but (good) excuses. To have a dream perpetually unfulfilled remains very sad to me. You, on the other hand, have chosen bravely to act and fulfill your own dreams and you moved to Israel last year at (what we think is) the tender age of 17, and have started your adult life in Israel. Your choice not to seek to shirk any of your duties as an Israeli soldier – as Americans certainly can do – is a wonderful tribute to you and your character. 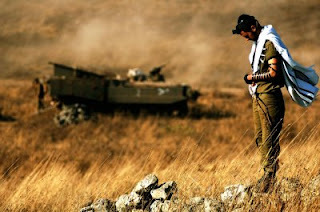 Your decision to enter the IDF with your hesder class represents an ideal manifestation of what Torah and Avodah really can mean in our world: You are living a life that properly balances the various duties and obligations and many have told me that doing so in the army is difficult and stressful. Protecting Israel and her citizens is a life saving activity for the community as a whole, and reflects well on every person who does it. Even if you fail on occasion to live up to the ideals (and who never fails?) that you set for your self, the solution is to try again and again to be better – but the mission you are on is a proper and holy one. I am so proud of that. Certainly, there are voices – even within our own community or family – who very much talk the talk of religious Zionism, but not only do they not walk the walk, they actively discourage the flowers of our community from actually fulfilling the obligations of Israeli citizenship. You should not listen to those voices. They are the voices of falsity and temptation. Every time you hear someone say “but why would you actually volunteer to serve” you should respond with the honest courage that I have heard from you many times: “if we do not serve, how can we actually claim to be real partners?” Indeed, sometimes the hollow and plastic nature of what passes for Orthodoxy in America is most visible in this area. American Orthodoxy, much as it engages in robust and diligent Israel advocacy and defense in America, hardly senses the centrality of military service to this process. You and I have both heard people tell you (and me) “but isn’t buying Israel Bonds – joining AIPAC – visiting for Pesach – spending a year studying – the same as actually joining the fight or living in the land?” But the answer is that it is not, and there is no substitute for the courageous thing that you are doing and I admire you for doing it. I am proud and happy with what you are doing and I am sure it is a change for the better for you and for all of us. You well know that it is not the custom or practice of the Broyde family to weekly bless our children (remember Australia?) but a letter of this type ought to end with a bracha. Beloved Aaron: God should bless you and watch over you during your service in the IDF. Our Creator should protect you and your fellow soldiers, making certain that your missions are successful and whatever sacrifices have to be made should never be in vain. Our Lord should ensure that you leave in peace and return in peace. Michael Broyde is a law professor at Emory University, a dayan in the Beth Din of America and the founding rabbi of the Young Israel in Atlanta.